A recent study of headlight quality performed by the Insurance Institute for Highway Safety (IIHS) revealed unsettling results. Of the 21 different SUVs that were tested, not one managed to earn their highest safety rating. The headlights of the Honda CR-V, Ford Escape, Mazda CX-3 and Hyundai Tucson managed to earn an “Acceptable” rating. All other vehicles, roughly two thirds of those tested, earned either a “Marginal” or “Poor” rating. This test came months after a similar study was performed by the IIHS on the top selling midsize car models out this year. Of the 31 cars tested, the Toyota Prius was the only vehicle who came away with the top rating. The other thirty cars were evenly divided amongst Average, Marginal and Poor ratings. Surprisingly, some of the cars that ranked lowest in both categories were the high tech or luxury models. Their advanced headlight options, such as headlights that shift direction as you turn the wheel, did nothing to improve this rating. Even options like high-beam assist, which automatically switches headlights from low to high beams depending on road conditions and the presence of oncoming cars, did little to off-set the poor quality rating. However, this might change soon. As early as next year, the IIHS will only give its prestigious Top Safety award to vehicles with headlights that manage to earn an Acceptable or Good rating. 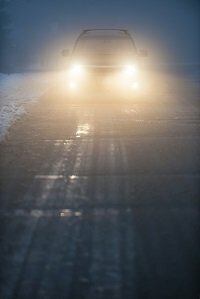 Foggy, broken or insufficient headlights can greatly decrease visibility on the road, both for yourself and the other drivers. The farther your headlights can shine, the more time you have to prepare for any hazards that might be in the road. Reaction time is critical, especially at night and in other low light settings, when visibility is already compromised. Functioning headlights are especially crucial as nearly half of traffic accidents resulting in fatalities occur either at night, dawn, or dusk, when visibility is most difficult. With the car models that earned a “poor” rating for headlight quality, it was difficult to see further than fifty feet down the road. This is dangerous, especially when travelling down roads at 60 or 70 mph. At such high speeds, a driver in a car with a poor headlight rating has only a fraction of a second to react to obstacles in the road.